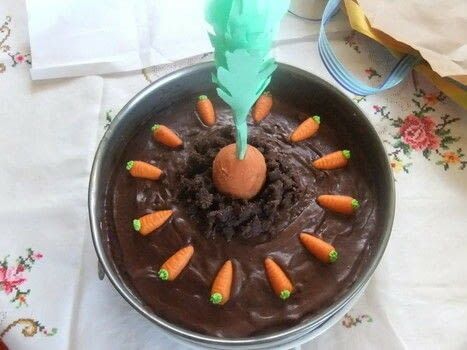 I made this for a friends birthday and I just love the way it looks with the carrot in the middle. I made the carrot from icing sugar, ground almonds, almond aroma, a few drops of water and food colouring. 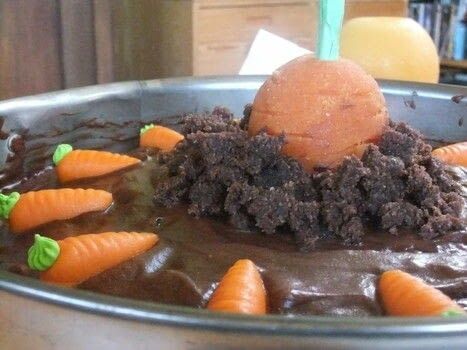 For the false dirt around it I used the same ingredients, but I replaced the food colouring with cocoa powder. I put the cake in the fridge for a night and after it warmed up again I put the leaves - made of green paper attached to wooden skewers - in it.